Bob-O-Dell Gun Club, photo taken from Hen-pecked lodge site down near the Virginia line, about a mile and a half from where I am standing. 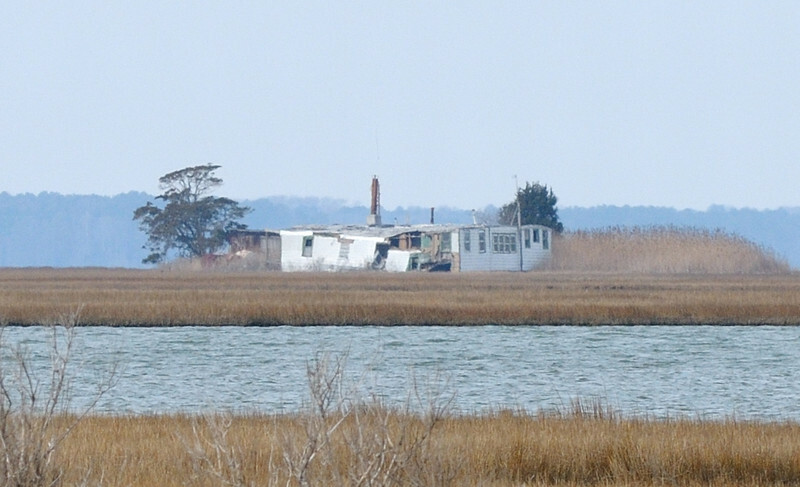 Located on Middlemoor Island it was also known as the "General Motors Club" as they spent $80,000 to establish it. Two floating shantys were dragged up on the island and put on pilings. An 18ft by 20ft living room was built between them. One side was the guides quarters and kitchen and the other side slept 6 members or guests. Last owner was local businessman "Buddy" Jenkins. Many famous people hunted there including Johnny Unitas. I hope to visit it by boat in the spring.